Having heard so much hype about Glossier makeup and skincare, as soon as they launched in the UK, I decided to make a small order. 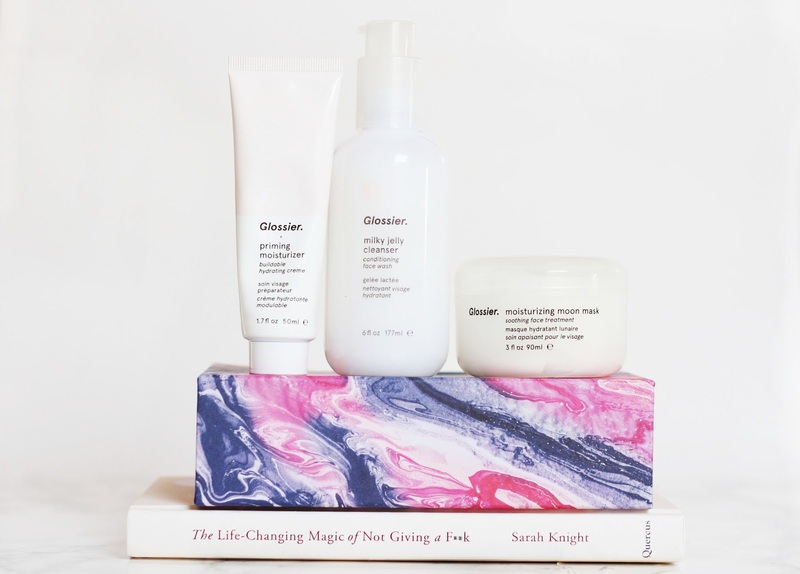 From watching videos and reading blog posts, I got the impression the Glossier makeup was for those who liked a minimal and natural look so I decided to try out the skincare first. I may make another order and buy some makeup bits like the Cloud Paints and the Highlighters in the future to see what I think of those as I've heard such good things. Priming Moisturiser - The reason I had purchased this was because I had heard someone saying it plumped the skin and make it look really healthy. I personally didn't notice this on my skin, it did feel moisturised and nourished but it didn't make a noticeable difference to how plumped my skin looks. The texture is very similar to the Embryollise moisturiser, it feels super nourishing on my dry skin and provides a good base for applying makeup. I bought this thinking that because it's called the "priming moisturiser" it would help to keep my makeup on my face and make it last longer however it seems Glossier mean it as preparing the skin and creating the perfect canvas. It definitely does prepare the skin however for £22, I do think there are other moisturisers that do a similar thing for a much more affordable price. Milky Jelly Cleanser - This is my favourite product out of the three I've tried and I can definitely see myself repurchasing it. Glossier do say you can use this on dry skin and use it as a makeup remover which I did try, I don't usually like using cleansers to remove eye makeup and this did sting my eyes so I now use micellar water to remove my makeup and then this to cleanse. I have noticed such a huge difference in my skin since using this product, I have less redness, my skin is so much calmer and the amount of blemishes I have has dramatically reduced. I am absolutely obsessed with this cleanser, I love the rose smell, the gel texture is really lovely to apply and it makes my skin feel so soft! At £15, I think the price is really decent and I would 100% recommend trying this if you haven't already! Moisturising Moon Mask - I have quite dry skin so I love to use these kinds of masks, my absolute favourite is the Origins Drink Up Intensive Mask. Although the instructions do say to wash this off, I leave it on like an overnight mask. After applying, it makes my skin feel really smooth and nourished. If I were to compare it to the Origins Drink Up Intensive Mask I would say that when I apply the Glossier one, I don't wake up with my skin still feeling soft and moisturised. With the Origins mask, even when I wake up I can still feel the effects of the mask from the night before which is why it's my top overnight mask. I do like this mask and it definitely does make the skin soft and plumped up however if I were to compare the two, I would recommend the Origins one. However if you're looking for a more affordable version, the Glossier one will do you well. Do you have any Glossier recommendations I should pick up?